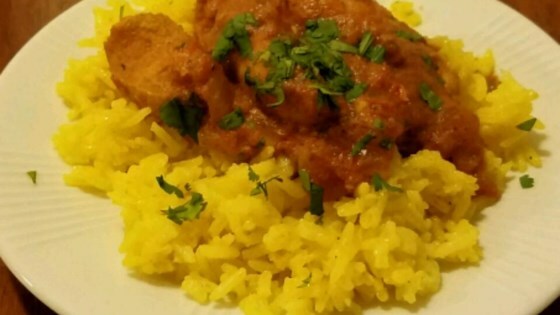 "Everyone's favorite Indian take-out dish, made at home quickly and simply. Even husbands can do it! Chicken thighs can hold up to a long, slow cook time; they may shred if left in for too long but the dish will still be just as delicious. You can easily double this recipe. It freezes well." Stir tomatoes, onion, garam masala, garlic, ginger, salt, brown sugar, cumin, and coriander together in a slow cooker until well-mixed. Place chicken thighs in tomato mixture. Cook on High for 3 to 4 hours (or on Low for 6 to 8 hours). Stir yogurt and cilantro into chicken mixture. im pretty sensitive to spicy dishes, and did not find it spicy. maybe an little more chuncky and less sauce based than i prefer, but it's decent enough. probably won't make it again though. I served mine over basmati rice. This chicken was delicious, but next time I'll make it spicier.